This fascinating disc features the lost generation of American composers, who took their inspiration from the German and French music of their continental teachers. 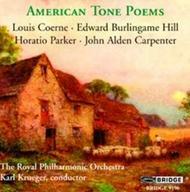 Of the four composers on this disc, Louis Coerne (1870-1922) is now the most thoroughly forgotten, though there was a time when he was among the most frequently performed American composers on either side of the Atlantic. In common with many others, Coerne found creative inspiration in the legends of King Arthur, of which the principal result was the symphonic poem, Excalibur, completed a year before his death. Edward Burlingame Hill (1872-1960) was an influential and respected composer, critic and teacher. Among his pupils at Harvard were Leonard Bernstein, Elliott Carter, Ross Lee Finney, Virgil Thomson and Randall Thompson. Hill�s early music shows the influence of Edward MacDowell, but his openness to French and other influences allowed him to forge a more distinctive idiom of his own as he matured. Stevensoniana, written in 1916-17, is subtitled �Four Pieces after poems of Robert Louis Stevenson�s A Child�s Garden of Verses�. Fittingly, this charming work shows considerable delicacy of feeling and display�s Hill�s talents as an orchestrator. Horatio Parker (1863-1919) is mainly remembered today as the teacher of the great Charles Ives, though in his time Parker was one of the most famous and highly esteemed composers in the English-speaking world. Parker wrote two symphonic poems, A Northern Ballad and Vathek. Parker was attracted to Nordic and Celtic subjects, and in A Northern Ballad produced a sensitive and beautifully orchestrated work much in the folksy modal manner of Delius or Grieg. Karl Krueger leads the Royal Philharmonic in this newly re-mastered recording.